01 Belyuth 1 The enthroning of Erok as the first Bethgar of all Urrika. 01 Norzec 9979 The birth of twin brothers, Jor-El II and Nim-El, to scientist Jor-El I. 01 Norzec 9982 Jor-El's first day at the learning center in the capital city of Kandor. 36 Norzec 9994 Jor-El graduates from the learning center. 37 Norzec 9994 Jor-El is assigned to Krypton's new space program at the Kryptonopolis Space Center, headed by General Dru-Zod and Professor Ken-Dal. Jor-El sees Lara Lor-Van, a trainee in the astronaut program, for the first time. 03 Belyuth 9995 Jor-El is assigned to the R&D department to develop a new, cheaper method of propulsion for their rockets. 36 Belyuth 9995 Jor-El isolates an atomic particle with anti-gravity properties. 68 Belyuth 9995 Jor-El duplicates the anti-gravity particle for the first time. 69 Belyuth 9995 Jor-El builds an anti-gravity device. 70 Belyuth 9995 Jor-El gives the first demonstration of his anti-gravity device to Dru-Zod and Ken-Dal. 71 Belyuth 9995 Professor Ken-Dal formally introduces Jor-El to Lara Lor-Van. The Science Council reluctantly approves Jor-El's new rocket project. 72 Belyuth 9995 Jor-El starts building a spacecraft out of gold, an abundant element on Krypton, based on his new anti-gravity technology. 30 Ogtal 9995 Lara is concerned about the slow pace of the space program, and sneaks aboard Anti-Grav I, which was intended as an unmanned space craft. Later that night, the test is executed but encounters problems. The ship eventually crashes on Wegthor, one of Krypton's two moons. 33 Ogtal 9995 Jor-El stows away on a traditional rocket, Colonist IV, scheduled to bring the first group of colonists to Wegthor. Jor-El locates Lara and rescues her. 37 Norzec 9995 Jor-El presents suspended animation gas to the Science Council as a means of dealing with criminals. He proposes that they be placed in orbit aboard prison-ships. During their long sleep, they would be susceptible to rehabilitation. The proposal is accepted. When Jor-El gives Lara the news, she suggests that they now have enough stability to marry, and brings him to Matricomp, the computerized marital system, for formal approval. They are analyzed by the computer, then sent home. They must wait for the results before proceeding. 67 Norzec 9995 Jor-El works with Jax-Ur, Krypton's best rocket-scientist, on the new prison-ships. 01 Belyuth 9996 Anr-Mu, a messenger from Matricomp, informs Lara that her marriage to Jor-El has been denied. Elsewhere, the first prison ship, carrying criminal Nali-Ilv, is launched. It crash-lands and Nali-Ilv escapes. It is soon revealed that Nali-Ilv was actually killed and replaced by his twin brother Ed-Ilv, on the orders of Tron-Et, a corrupt Science Council member. Jor-El later learns that his marriage to Lara has been denied. He discovers that Matricomp has fallen in love with Lara, and that Anr-Mu is an android of its creation. Matricomp is disabled. 47 Ullhah 9997 Jor-El and Lara Lor-Van wed. The spacetime-traveling Superman, using his Kryptonian name, Kal-El, is present for the ceremony. Superman has befriended Jor-El and Lara, but has not revealed to them his true identity. 02 Hefralt 9997 Jor-El I brings his son, Jor-El II, to Antarctic City where he prepares to tell him of his recent discoveries. An ice bird causes their flyer to crash, injuring the elder Jor-El, who slips into a coma. 03 Hefralt 9997 Back in Kandor, Jor-El finds his father's notes about unstable elements in the planet's core. Superman, aware of Krypton's pending fate, agrees with Jor-El that he should check into it. 05 Hefralt 9997 Jor-El gathers a group of friends in his brother Nim-El's home and tells them of Krypton's unstable core. He explains that the process had begun millions of amzeto ago, and estimates that the planet will explode in two to three more amzeto. Director Ven, Nor-Kann, and his younger brother Zor-El are among those present. Zor-El thinks his brother is wrong and returns to his home in Argo City. 17 Hefralt 9997 Jor-El tells the Science Council that they should build huge space arks to save the populace of Krypton. The Council is suspicious that Jor-El is simply trying to revive his spacecraft projects. Jor-El and his friends, including Nim-El, Director Ven, Professor Ken-Dal, and Superman, start designing their own space arks in the capital city of Kandor. 22 Ogtal 9998 Jor-El I comes out of his coma just long enough to tell his son about a Krull spacecraft buried in the Antarctic. The Krull were an alien race of space travelers wiped out ages ago when their world was destroyed. The ship contains an advanced warp-drive engine. Jor-El I dies before he can give his son the exact location. 23 Ogtal 9998 Jor-El and Superman search for the Krull ship, but find nothing. 24 Ogtal 9998 The funeral of Jor-El I is held. 33 Ogtal 9998 Work on the first space ark is progressing and nearly done. Jor-El, Lara, Superman, and Lyla Ler-Rol leave Kandor for Argo City to try and persuade Zor-El to listen to reason. The android called Brainiac of Colu appears above Kandor in a spacecraft. He uses his Coluan technology to shrink and steal the city and its six million residents. 35 Ogtal 9998 Kryptonopolis takes up the workload of the Kandor system. Superman returns to the Earth of the future. Jor-El is ready to give up all hope. Lara informs her husband that she is pregnant, revitalizing him. 13 Ullhah 9998 Jor-El speaks before the newly-elected Science Council. They allocate substantial funds for research. 53 Ullhah 9998 Rol-Nac, an exiled space-wanderer, saves Jor-El when the first test-flight of his space model malfunctions. 35 Eorx 9998 Lara gives birth to a son. 38 Eorx 9998 Jor-El and Lara's son is christened "Kal-El", meaning "Star-Child". Rol-Nac is present as Kal's godfather. 03 Ullhah 9999 After months of studying other dimensions in which Krypton's populace might escape, Jor-El develops the Phantom Zone projector. 02 Eorx 9999 Jor-El shows the Phantom Zone projector to the Science Council, and suggests it as a new form of imprisoning criminals. His discovery gets him nominated to the Council. His opponent for the open seat is Gra-Mo, who has invented a green android. When Gra-Mo's invention fails, he blames Jor-El. Gra-Mo is arrested later that day for tampering with the robot-police. He and his gang become the last criminals to be placed in orbit. Jor-El is made a member of the Council. 10 Eorx 9999 Dr. Mar-Ko of Antarctic City notifies Jor-El that he has found the Krull space-ship. 11 Eorx 9999 Jor-El and Lara arrive in Antarctica. 62 Eorx 9999 Jor-El, Lara, and Mar-Ko have finally figured out how to fly the Krull ship. Elsewhere, Jax-Ur, the former chief rocket scientist and now renegade, is secretly testing a miniature atomic weapon. If the test of his rocket succeeds, Jax-Ur hopes to rule the entire planet. Jax-Ur aims his armed rocket at a large meteor, but it overshoots the target. The rocket hits and is deflected by the Krull ship. The rocket strikes Wegthor, one of Krypton's two moons, destroying it in an enormous nuclear explosion. The Krull ship is badly damaged. It lands and explodes. Jor-El, Lara, and Mar-Ko barely escape with their lives. 67 Eorx 9999 For defying the law forbidding non-governmental experimentation on untested explosives, and for the slaughter of 500 colonists on Wegthor, Jax-Ur is sentenced to the Phantom Zone for the rest of eternity. The Science Council vote on and approve Ran-Dar's resolution to ban space travel. Jor-El decides he must continue his experiments on a warp-drive engine in secret. Fel-Kar, leader of the Council, assigns a detective, Par-Es, to watch Jor-El. Jor-El tracks an orbiting piece of debris which he believes could be a Krull engine dislodged during the collision. It is in a decaying orbit and will eventually land in the Scarlet Jungle. 34 Belyuth 10000 Faora Hu-Ul, General Dru-Zod, and Kru-El are sent to the Phantom Zone. Faora is sentenced to 300 years for the deaths of 23 men. General Zod is sentenced to 40 years for an attempt to overthrow the government. Jor-El's cousin, Kru-El, is sentenced to 35 years for developing an arsenal of forbidden weapons. 54 Belyuth 10000 Jor-El places his son's pet dog, Krypto, into a prototype ship for the first test of his primitive warp-drive. The ship is lost when it strikes a stray meteor. 12 Ogtal 10000 The Krull engine falls to Krypton, landing in the Scarlet Jungle. Jor-El goes to retrieve it. Par-Es follows, but is foiled. Jor-El finds the Krull warp-drive intact. He is unaware that he has contracted Scarlet Jungle Fever. 14 Ogtal 10000 Jor-El continues to study the Krull warp-drive, having not slept since his return. 17 Ogtal 10000 Jor-El collapses. The Phantom Zone criminals combine their mental power to trick the weakened Jor-El into almost freeing them, but Lara arrives just in time to stop him. 19 Ogtal 10000 Jor-El's sickness is diagnosed. 23 Ogtal 10000 Jor-El's fever finally breaks and he returns to work on the warp-engine. 24 Ogtal 10000 Reports of major quakes pour in from many regions. The Science Council issues a statement blaming minor shifts in the planet's orbit. 29 Ogtal 10000 The Science Council orders Jor-El to launch Kru-El's forbidden cache of weapons into space on the last operational rocket. To prevent the Phantom Zone criminals from ever again manipulating someone into freeing them, Jor-El adds the Phantom Zone projector to the cargo. 30 Ogtal 10000 The forbidden weapons are launched. 34 Ogtal 10000 Jor-El's new model rocket, using a warp-drive adapted from Krull warp technology, is ready for testing. A monkey named Beppo is intended to be the test passenger. Before he can ready the monkey, Jor-El's equipment detects a vessel in deep space heading towards Krypton. Jor-El races to the landing site. It is Lar Gand, a space traveler from the planet Daxam. Jor-El explains in Interlac, a galactic language, that Krypton's ban on space travel could lead to Lar's arrest. Jor-El gives Lar a star chart directing him to Earth. 39 Ogtal 10000 The Science Council meets early in the day to effect the arrest of Jor-El for warning Lar Gand away. Jor-El's probes reveal that the core has reached critical mass. He tells his wife to fetch their son. Just before Jor-El and Lara place their son in the model rocket, the monkey Beppo unknowingly sneaks on board. Although there is also room for one adult, Lara decides to stay with her husband. Jor-El and Lara watch as Kal-El is rocketed away from Krypton. Shortly after lift-off, Krypton explodes. The small craft enters a space-warp, headed to Earth. Large amounts of the irradiated debris follows through the warp before it closes. Miraculously, Argo City and its inhabitants survive, as a chunk of the planet containing the domed-city hurtles into deep space. Two days later, Kal-El lands in a rural area in the U.S., where he is found and adopted by the Kents. (1) The age of Superman. Throughout the 1960s, the editors of the Superman books maintained that Superman was perpetually 29 years old. Analysis on his adventures, taken alongside those of Batman and Robin, suggest however that around 12 years passed between the debut of Superman in Metropolis and the Crisis On Infinite Earths. Since Superman debuted around Clark Kent's 22nd birthday, and he was born on February 29th (a leap year), and if we assume the Crisis took place in 1986, then Superman must have been born in 1952. (2) The distance to Krypton. The clue to the distance to the planet Krypton comes from an adventure published in 1978, in which the light from Krypton's explosion finally reaches Earth. When scaling the real-time adventures to the 12 year span assumed above, this adventure would have taken place about 4 years before the Crisis On Infinite Earths. Given that Krypton exploded in 1954, and the light reached Earth circa 1982, then the distance between the two planets must have been around 28 light years. All computations are based on the 838 days per 734 zetyaro criteria, with consideration given to the statement that 18 amzet equal about 25 Earth years. There are a number of possible scenarios. Kal-El may have been born early or late on February 29th 1952. Krypton may have exploded early or late on June 16th 1954. 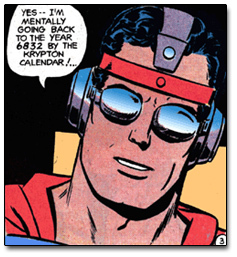 Kal-El may have been born early or late on 35 Eorx 9998. It has been established that Krypton exploded early on 39 Ogtal 1000. The combination that results in a number that comes closest to 18 amzet per 25 years is: Kal-El was born late on 35 Eorx 9998 and early on February 29th 1952, Krypton exploded early on 39 Ogtal 10000 and late on June 16th 1954. Kal-El's rocket landed on Earth early on June 18th 1954, having spent two days traveling through a spacewarp from Krypton. This leads to the rough estimates given above.